We’ve been back home for more than two months, but I am still enjoying the inspiration from our three weeks in Southern Italy. At Cala del Citro we had a wonderful dinner, that ended with almond ice cream. I loved it and wondered why I had never thought of that myself before? The recipe is very similar to making pistachio ice cream, and I served it with the same garnishes as at the restaurant: amarena cherries and crushed amaretti cookies. 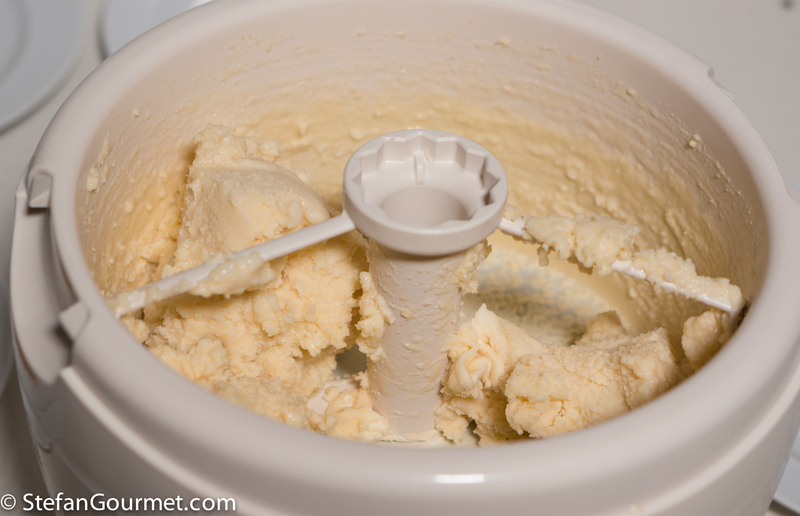 This ice cream has a great almond flavor and it is very easy to make, as no eggs are used. 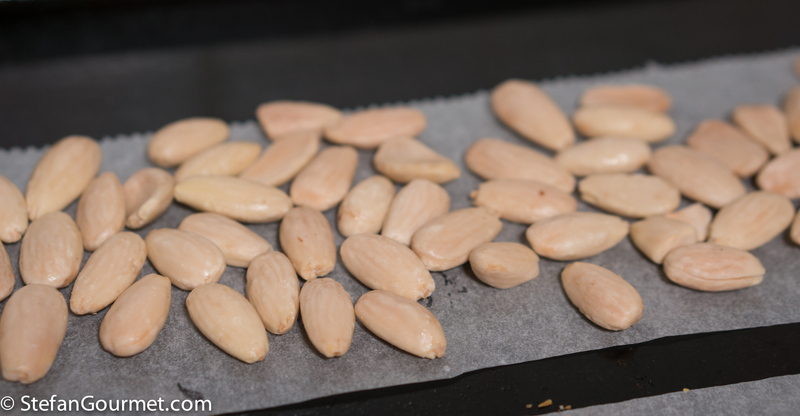 Roast the almonds for about 8 minutes at 180C/350F. They should be slightly browned, but not dark (as they will become bitter). Roasting brings out the flavor of the almonds. 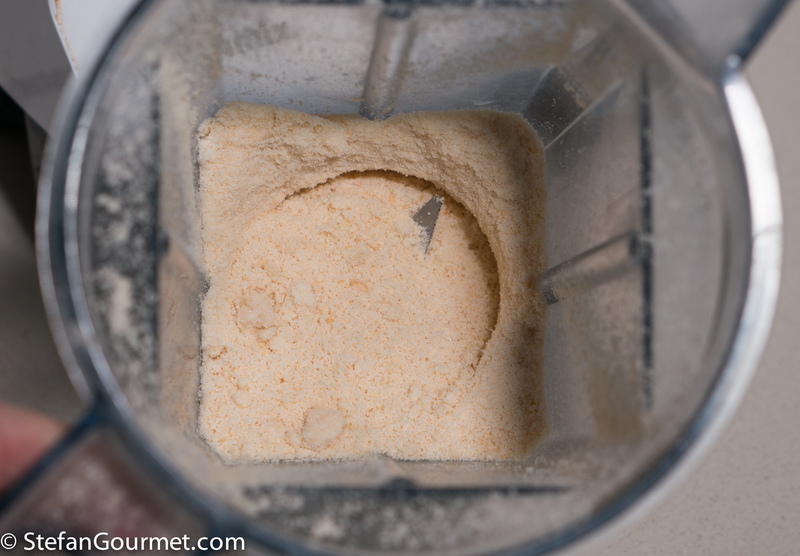 Grind the almonds together with the sugar in a food processor. By grinding them together, the sugar will absorb the oil that comes out of the almonds, thus avoiding creating almond butter. 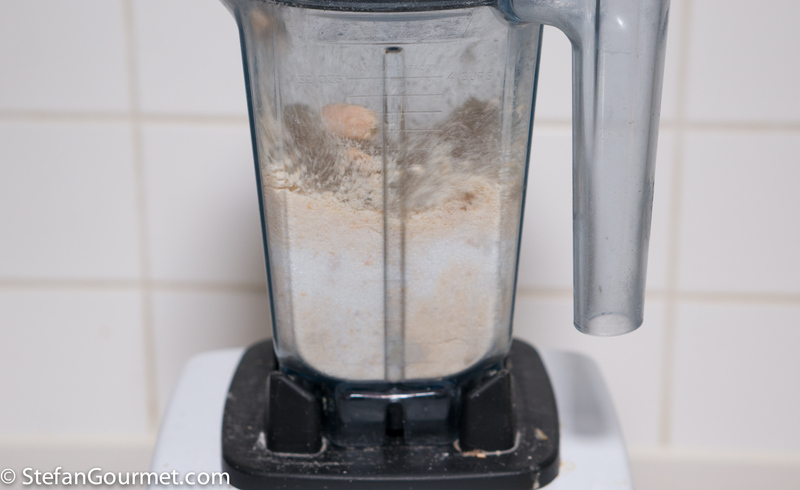 For a fine texture you should use a powerful blender such as a Vitamix. 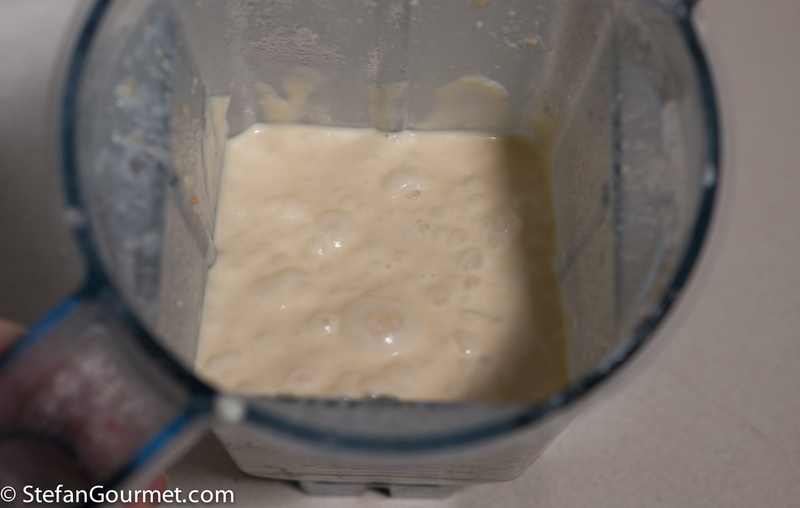 The mixture should end up as a fine powder. 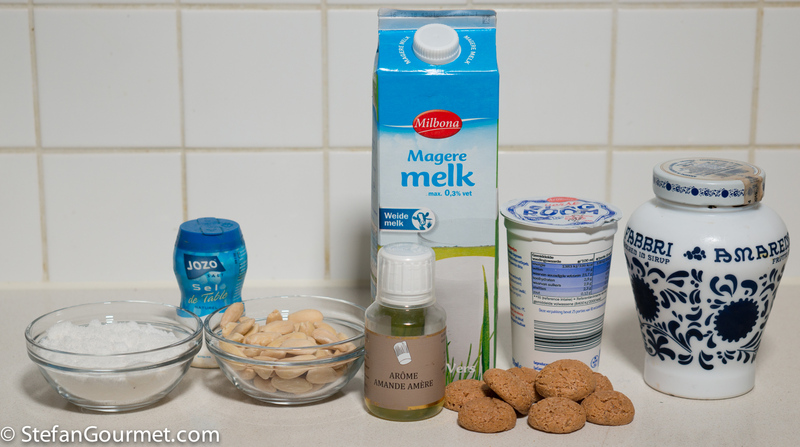 Combine the milk and cream, and add it to the almonds. 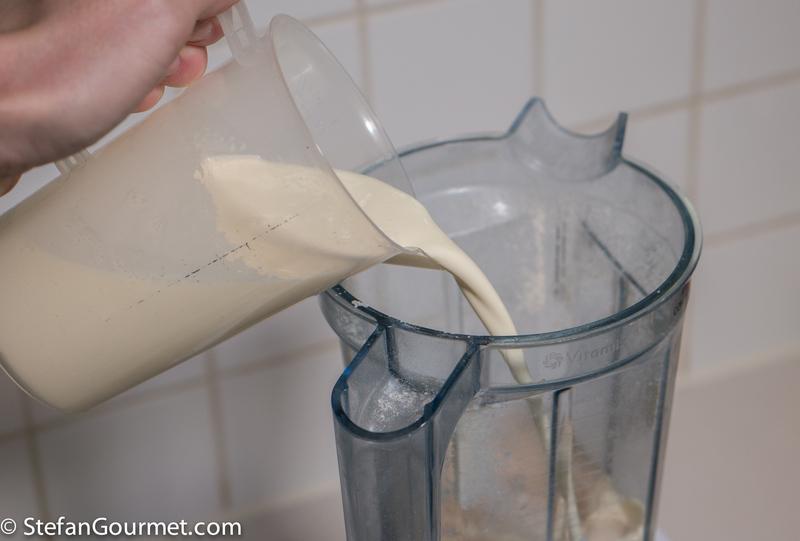 You will need 325 ml (1 1/3 cup) of a mixture of milk and cream, and you can control the fat content yourself. The more fat, the creamier but the more calories. I used 250 ml (1 cup) 35% cream and 75 ml (1/3 cup) skim milk. 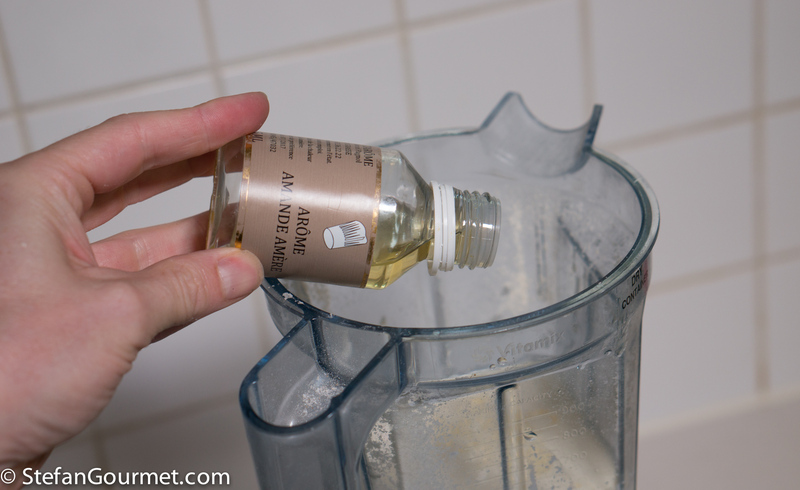 Add the almond extract and a pinch of salt. Process again until it is mixed well. Cover and chill this mixture in the refrigerator. 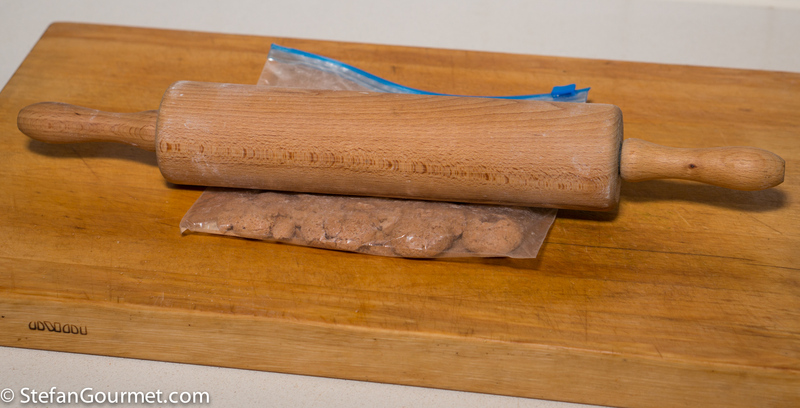 Crush the amaretti cookies with a rolling pin. If you put the cookies in a ziploc bag first, this is less of a messy process. 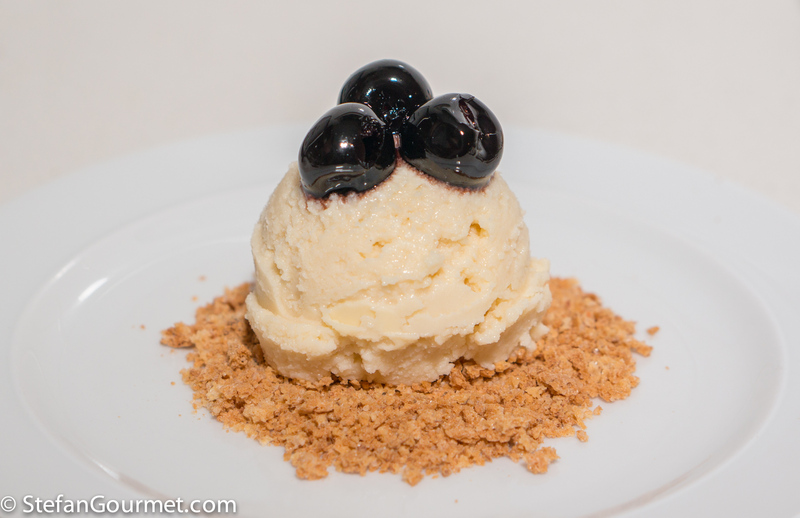 Garnish the ice cream with the crushed amaretti and amarena cherries. Many Italian dessert wines of the “passito” type will work very well with this, such as Verduzzo or Picolit from Friuli. 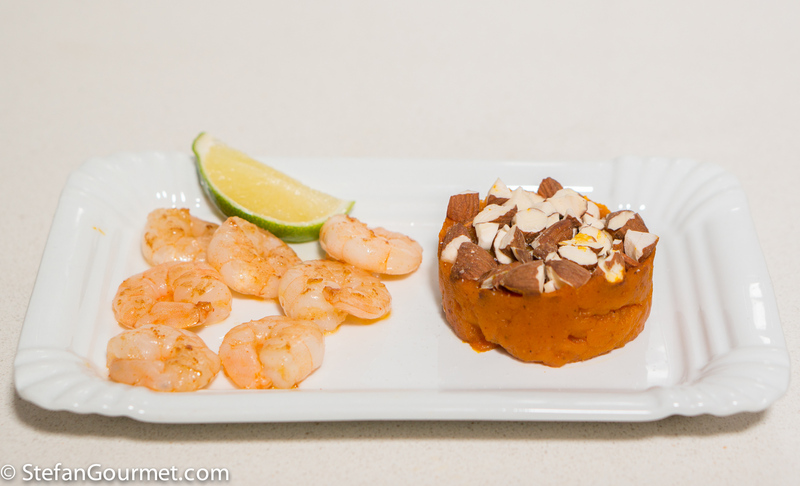 This appetizer of shrimp, pumpkin, and almonds is perfect for the season. As shrimp are earthy and sweet, pumpkin is a good combination. To add some crunch that would work well with both shrimp and pumpkin and stay within the autumn theme, I decided to include almonds. And finally just a bit of lime and chilli pepper to add some excitement. Yum! Looks so inviting! A recipe to save for when I’ll own an ice cream maker! You darn well know why I am smiling – you have done well . . . well, loving anything almond, how can I not try as the Yule season and friends walking in ad hoc is approaching . . . and I do not have an ice cream maker but do ‘get around’ that . . .
Great recipe. The cherries are literally the cherry on top! Si puo’ fare il gelato senza gelatiera in freezer, mescolando ogni 30 o 60 minuti. Un gelatiera come ce l’ho io non e’ tanto caro.